Although the latest release of BMC Software’s Remedy ITSM platform – version 9.0 – contains no major new features, it has been re-engineered from a C-based into a Java-based application. The significance of this change will, doubtless, be to facilitate future development of this business-critical system. Scapa Technologies has a vast amount of experience in testing and monitoring this type of system and, along with our partners at Alderstone Consulting, we didn’t want to let the release of this milestone ITSM version pass by without conducting our own research into its potential performance levels. We, therefore, conducted a number of benchmark tests comparing version 9.0 against the last 2 major releases of ITSM. Three identical environments were set up in order to conduct a fair analysis of how these ITSM releases compare. We installed ITSM 7.6.04, ITSM 8.1 SP2 and ITSM 9.0 with default configurations and used Scapa Test and Performance Platform (Scapa TPP) to perform the performance tests. Our initial findings show that ITSM 9.0 has very similar performance characteristics to ITSM 7.6.04. However, ITSM 8.1 SP2 showed marginally improved stability at the edge of capacity than either of the other two versions. 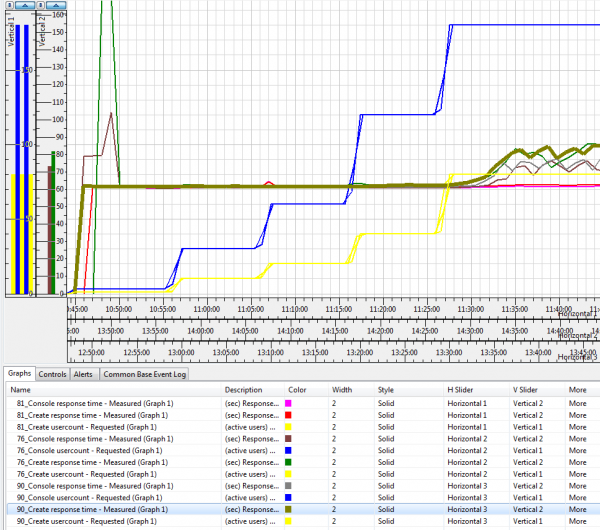 The graph below shows how the performance varies between the three main systems as the user count ramps up. Both ITSM 7.6.04 and ITSM 9.0 begin to behave erratically and user response times spike when the concurrent user load increased from 160 to 260, whereas the ITSM 8.1 environment remained constant. The full report of the results and findings of our tests, published by Alderstone Consulting, can be downloaded here. Although these tests and the analysis of the results provide an interesting insight into the core stability and performance of these versions of ITSM, they are based on a very limited set of use cases. Similar tests examining the relative performance of your own system running version ITSM 9.0 would, without doubt, produce different findings, given that usage and environment, amongst other factors, all have an effect. Both Scapa Technologies and Alderstone Consulting can help you understand how your system would perform on ITSM 9.0. Alderstone Consulting is a product and services company, focusing on very high quality solutions in the IT Service Management, Data Centre Management, Cloud and Banking markets. Scapa Technologies’ tools measure the end to end performance of the system, from the users’ perspective – the measurement that is most meaningful to your business operations, productivity and profits AND which produces the most accurate results. Our approach to testing, benchmarking, capacity planning, regression testing and production monitoring – by replicating real users’ actions to obtain their perspective of how your systems perform – is unique. Our tools are capable of testing many systems, as well as a mixture of API and GUI tests at the same time, so you can identify bottlenecks and other potential issues quickly, to maintain performance and Service Level Agreements (SLAs). Our expertise in building custom workflows for a wide range of systems is second to none. This experience, coupled with the flexibility of our tools, is the best solution for building a robust, reliable testing framework for your unique application mix. Please contact us for more information about how we can help you ensure that your ITSM 9.0 upgrade meets your performance needs.